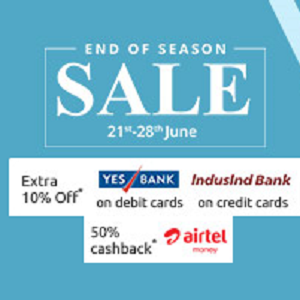 10% Instant Discount on Yes Bank Debit Cards on a minimum spend of Rs1500. The Maximum Discount amount that can be availed is Rs.1000. On the Payment Page, choose Yes Bank Debit cards. Enter your Yes Bank debit card details on the payment gateway page to avail the discount. Offer valid only during the EOSS period – from 21st June to 28th June, 2016. Maximum discount value that can be availed is Rs.1000, during the offer period. Offer applicable site-wide on www.shopclues.com only (includes Desktop-site, Mobile-site & App). The discount may be availed no more than twice per cardholder. Offer will be valid only for the transactions done through valid Yes Bank debit cards only. Discount will be calculated on the net amount payable by the customer, for valid debit cards only. In the event sub-orders are cancelled or returned, the corresponding value will be deducted from the paid amount, for calculation of Discount. Yes Bank & SC reserve the absolute right to withdraw and / or alter any of the terms and conditions of the offer at any time without prior notice. Nothing expressed or implied in the program shall in any way waive or amend any of the terms and conditions already existing in the agreement between the Card holder with the Card issuer. Yes Bank does not make any warranties or representation of the quality, merchantability, suitability or availability of the products or services included in this offer. In case of cancellation of order, the customer would not be able to avail the offer again. This discount is not applicable on coins and bars, gift cards, memory cards, storage devices and precious jewellery items. On the Payment Page, chose Airtel Money wallet for payment. Complete the payment to get a cashback in your Money wallet. Get 50% instant cashback on payment via the Airtel Money wallet. Sign Up platform, Coupon Redemption and Payment should be done on Airtel Money wallet. Offer valid for all Shopclues users only. The offer is valid from 21st-28th June, 2016, both dates inclusive. User can redeem the coupon code only once per wallet. Cashback will be auto-credited to users Airtel Money wallet. Valid once per registered email id. On validation of the promo code, discount will be provided upfront on the total transaction amount upon using the promotion code on www.yatra.com or Yatra Mobile App. Only one promo code is valid per booking.